So I had some leftover sweet potato from last week's farmer's market. I picked up some fresh apple cider this week too. I was debating what to make as a side dish this week and I was toying with doing my classic herb-apple mashed potatoes, sweet potato style. But then, Thursday night, I went to Supersol and picked up a container of their roasted corn salad and had that with dinner - it was roasted corn and peas, and it was delicious! This inspired me and made me think of trying out a dish I've only heard of - succotash. Now, like many people, I am of course most familiar with succotash from Looney Tunes' Sylvester Cat saying "S-s-s-sufferin' succotash!" I never really knew what that meant till one day I saw a box of succotash in the freezer section of the supermarket - corn and lima beans. Of course, lima beans were my arch enemy as a kid - I would always pick them out of vegetables or soup that my mom made. So why would I want to subject my friends (or myself) to the bland and mealy texture of lima beans? Certainly not. I decided take this old-fashioned classic and modernize it a bit - I chose to use edamame (soy beans) instead (they actually came in this amusing Dora the Explorer package). I combined that with my leftover sweet potatoes, since the meal I was going to was a Thanksgiving-themed meal, and I added some other veggies to give it a really bright color. I snuck in my fresh apple cider too which gave it a tinge of sweetness and fleshed out the flavors beautifully! 1. Shuck ears of corn, cleaning off husk and silk. Soak corn in water while oven preheats to 450 degrees. 2. When oven is ready, wrap each ear of corn in aluminum foil and put on the middle rack. Let corn roast for 20-30 minutes. 3. After corn is sufficiently cooked and golden yellow, unwrap the corn, keeping it in the foil and put them under the broiler for 5 minutes or so until kernels become golden brown. You may need to turn the cobs around a few times. 4. Halfway through corn cooking, saute onion and bell pepper together in oil in a skillet over medium heat until onions are soft. Add frozen edamame and sweet potato. 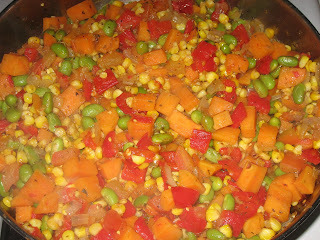 Cook for 5-10 minutes until edamame thaws and sweet potatoes start to soften a little. 5. When corn is done, shock them in ice water to stop the cooking and make them easier to handle. Slice off kernels and add to skillet, along with tomatoes, thyme, parsely, salt and pepper, and mix. 6. Add chicken stock and apple cider, and drizzle a little honey over everything. Raise heat to medium-high, mix well, and continue mixing periodically. Cook until liquid is nearly entirely evaporated, and serve! 2 WW points per serving. I really like the idea of edamame instead of lima beans- adds some nice protein too!